This year, we are celebrating our 30th Anniversary. Born in September 1988 out of a desire to show the love of God, Anglican Overseas Aid is an Anglican response to a suffering world. 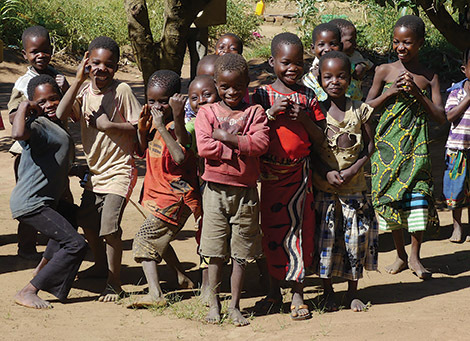 We have come a long way since the early days in 1988 when the late Archbishop David Penman set up the Archbishop’s International Relief and Development Fund. We have responded to many needs around the world since then. From the 1994 genocide in Rwanda, to the 2004 Boxing Day tsunami, to cyclones and earthquakes in the Pacific region, we have worked with our partners on the ground to provide life-saving needs to communities devastated by crisis and disaster. Our work, however, has not just been limited to emergency relief. We are also committed to community development, and our model of using a strengths-based approach to long-term sustainable development has seen many thousands of people lifted out of poverty and given the chance of a better life. A sense of dignity is central for every human being, especially those living in poverty. Poverty is more than a lack of material possessions; it is lack of self-opportunity and therefore a loss of a sense of dignity that is at its heart. That is why our work focuses on looking at the strengths, abilities and assets that communities already have. It is important for organisations to remember their history and celebrate milestones. That is why we are marking this historic moment; we want to remember and share with you where we have come from and why we have chosen to do what we do. 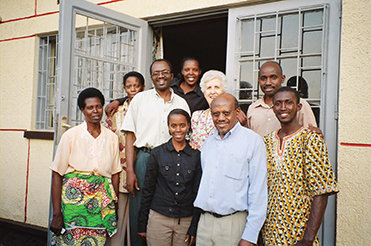 Beth Hookey (centre) with the partner team in Rwanda. In preparing for our 30th anniversary, we spoke to some people who were involved in shaping AOA: Beth Hookey, Denise Nichols OAM and Archdeacon Emeritus Philip Newman OAM. Denise Nichols has been a past Deputy Chair of the AOA board and, along with her husband, Archdeacon Alan Nichols AM (who was the first Director of the fund), has also emphasised the strong connection between AOA and churches. Denise says that AOA’s deep Christian faith is not only a strength locally but also overseas in the field. 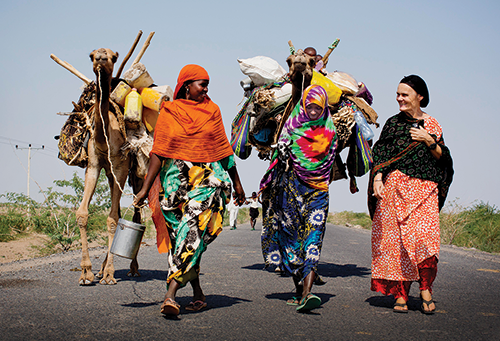 An 18 year partnership with Valerie Browning and APDA in Ethiopia has given AOA the privilege of working with local nomadic communities to offer them better access to healthcare and education. “People are enormously interested in connecting with their church and Christian counterparts and wanting to not only do something that shares what we have in a material way, but also trying to live out the Gospel”, she said. Archdeacon Philip was a founding member of the Fund and was instrumental in spearheading our work in Rwanda during the genocide of 1994. He met with Rwandan bishop Belindabegabo and was confronted by the horror of thousands of lives lost and devastated. These people are central in our history, and we are thankful for their incredible legacy. There are many more, too many to name, however we are grateful for everyone who has been involved, and most importantly, we are grateful for every supporter who has made the work possible. Just like the Good Samaritan in Jesus’ famous parable, we serve anyone regardless of race, religion or gender. As our CEO, Bob Mitchell, says, “we are striving…to provide a glimpse of God’s kingdom on earth as it is in heaven”. We have served with this hope for 30 years and, God-willing, we will continue to do long into the future.